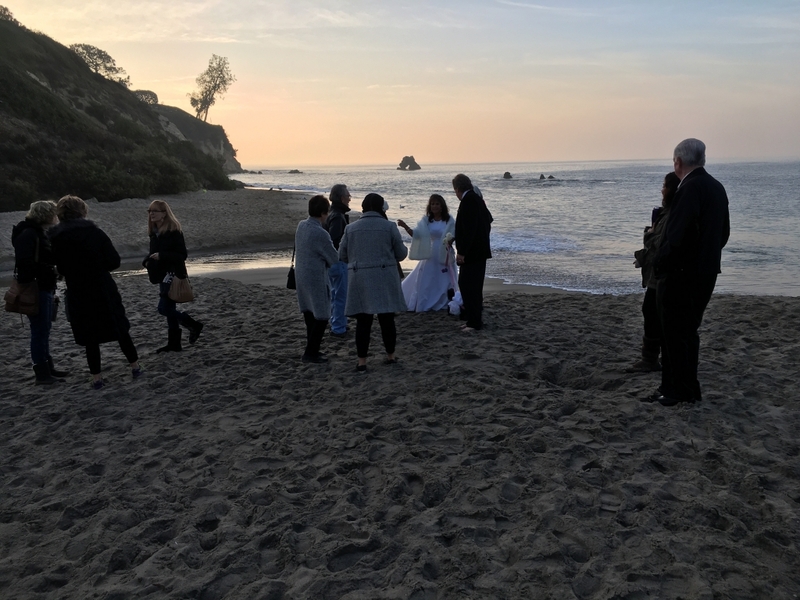 Two winter-holiday “Little Corona del Mar” wedding ceremonies, conducted by Rev.Dr. Gary Barmore, were blessed by glorious setting and perfect weather. 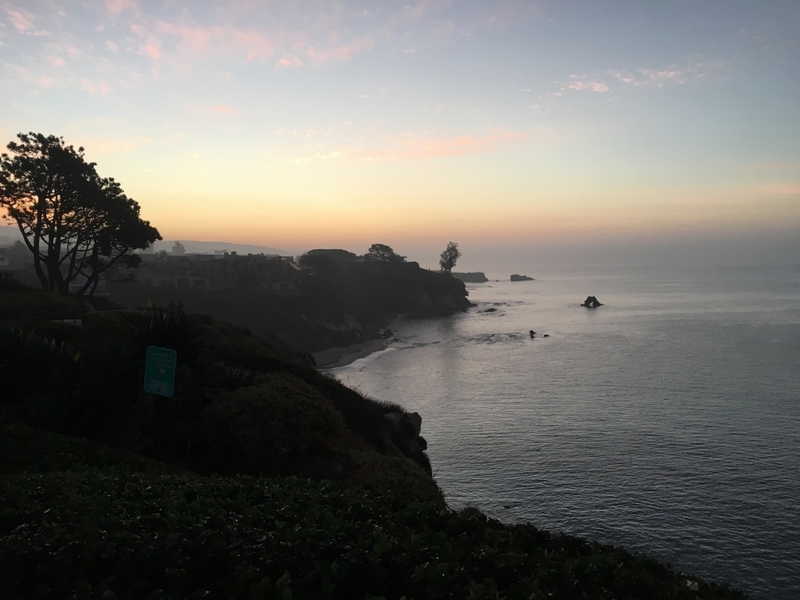 On Christmas Eve Day Gary Schenk and Rose-Anna Romero pledged their eternal love in the cathedral-cove while gentle waves ebbed in and out before them. Then at first light of the first day of the New Year, joined by fifteen early-rising friends, Dennis Prat and Gloria Morgan stood on the sand where the stream enters the sea, and expressed their love, their faith and their joy — joy not only for their marriage, but joy for finding the ring which fell into the sand during the best man’s handoff. 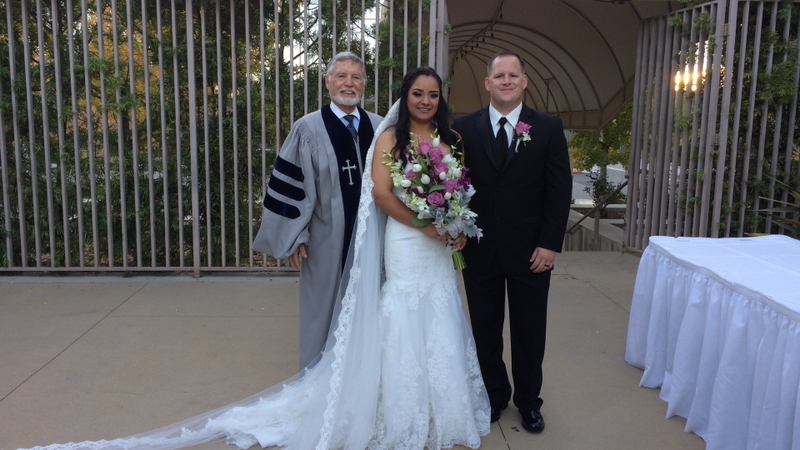 Both couples expressed gratitude to Great Officiants of Long Beach for providing Rev. 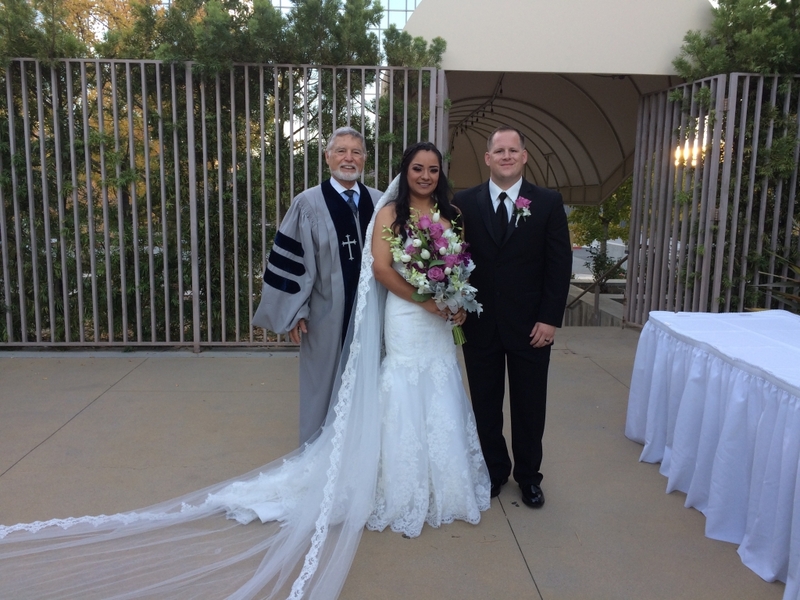 Barmore’s personal and dynamic ministry for their beautiful, wonderful day! 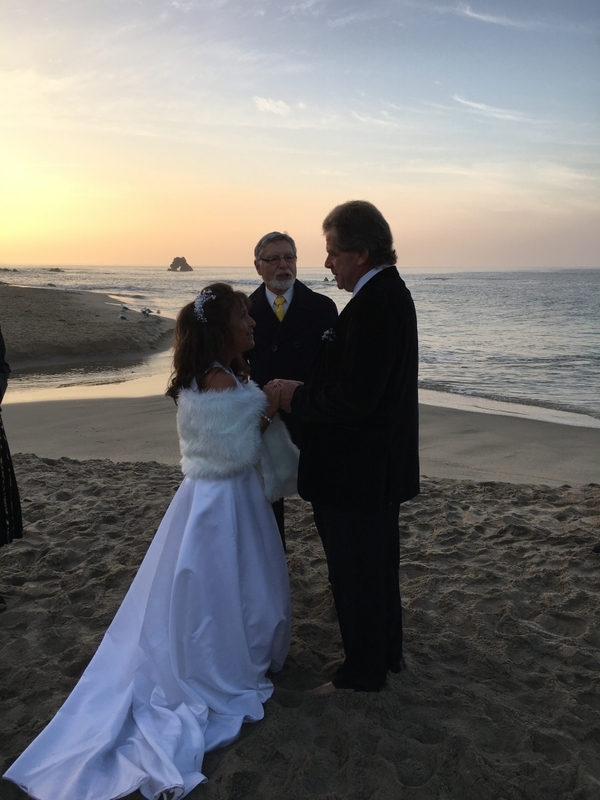 Jerry Palazzo and Debora Acciarito, finding one another in mid-life as the perfect marriage match, wanted so much to have a beautiful wedding to match their love. But venues and extras were way beyond a responsible budget for this track coach and language teacher. 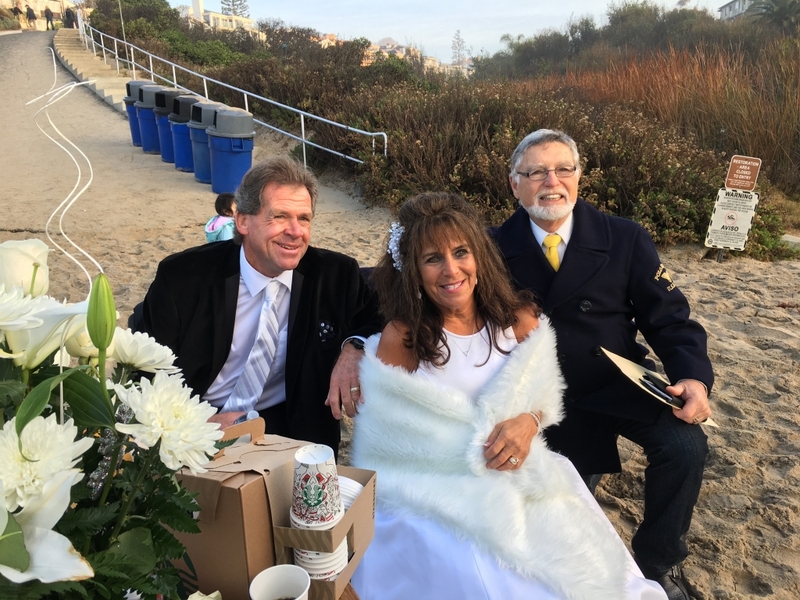 Instead, they crafted an amazingly beautiful and romantic wedding day with just two phone calls: (1) to a dear friend whose home on Balboa Island includes a Duffy Electric Boat, and (2) to Great Officiants of Long Beach, who put them in touch with Rev.Dr. Gary Barmore. 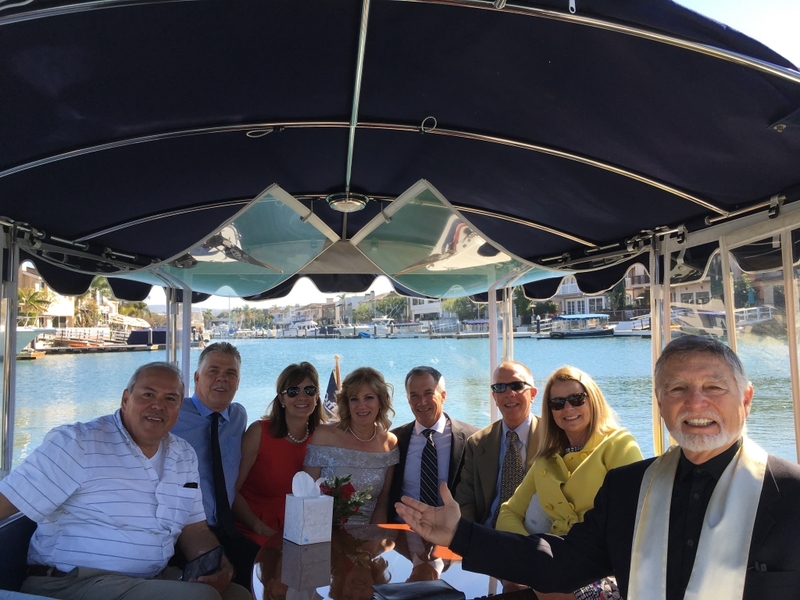 Meeting with Gary, a touching and joyous ceremony was crafted, and on February 4 (in the morning before Super Bowl kickoff) ten friends boarded Captain Chris Price’s sparkling vessel and in perfect weather motored to a beautiful cove for the nuptials. As Gary pronounced them husband and wife, a jet passing over provided an exclamation point to the declaration — as if it too was planned. After dropping off the minister and signed license, the merry crew crossed the bay to dock and celebrate at a Newport restaurant. All the money in the world could not have provided Debora and Jerry more satisfaction and joy than this one that launched their married life together.